Today is the day that the JP Generation has been waiting for since our beloved Pope John Paul II passed from this life into the life of Heaven – his first ever feast day in the Catholic Church’s liturgical calendar. He is officially a canonized Saint of the Catholic Church. Knowing the example that the modern world needed when it came to heroic virtue and holiness, Pope John Paul II canonized 482 Saints of the Church at 51 canonizations and beatified 1338 at 147 beatifications. Blessed with a long papacy, John Paul II accomplished more than many of his predecessors combined. Although I could write so much on him at this moment, it’s hard to find the right words today with the emotions in my heart that are pouring forth from my eyes when I think of him in Heaven with the Holy Trinity and the Blessed Virgin Mary, the Saints he canonized and beatified as well as with the other great Saints of the Catholic Church. Over the past 2 years and 9 months, including this very blog post, I have written on Pope John Paul II 52 times. 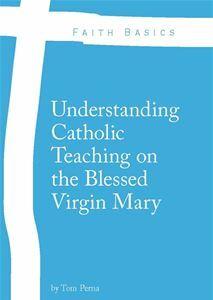 That’s how much of an influence he has had on my life as a Catholic man, a Catholic educator, and as a Catholic blogger and speaker. You can read every blog post written on him here. 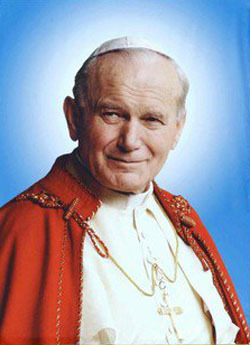 I would highly encourage you to read the many words I have provided to you over this time about the Great Pope St. John Paul II. 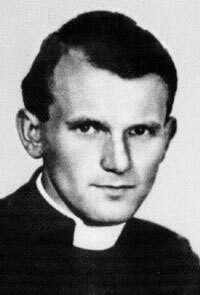 The young Karol Wojtyla, ordained November 1, 1946. Rome parishes: He visited 317 of the 333 parishes. 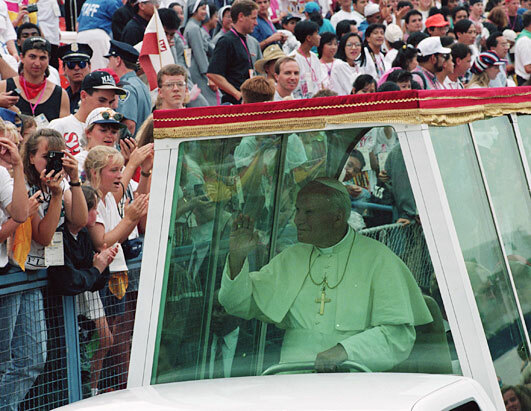 Pope St. John Paul II in Denver for World Youth Day 1993. Cardinals of the Church: In 9 consisitories, he created 231 Cardinals. Writings: Encyclicals – 14, Post-Synodal Apostolic Exhortations – 15, Apostolic Constituions – 11, Apostolic Letters – 45, Books published – 5. So on this day, the first feast day of Pope St. John Paul II, let us ask our beloved Pope and Saint to continue to pray for the intercession of our personal prayers, prayers for the Catholic Church, and prayers for the entire world. Let us also continue to pray for the intercession of the Blessed Virgin Mary. John Paul II had a deep devotion to Her from his earliest days as a young boy in Poland. 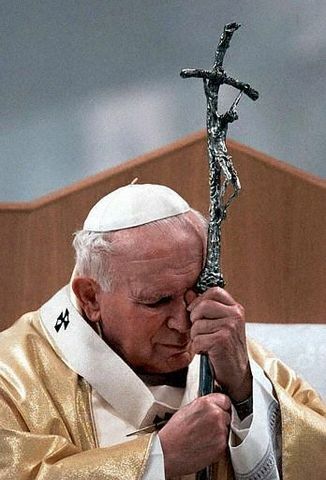 POPE SAINT JOHN PAUL II…PRAY FOR US!